I'm new to the forum. I picked up a 2002 VFR1000 (996 Superhawk) and am working on getting it street-able again. The kid I bought it from didn't have the money to fix it up and was leaving the area, so just wanted to get rid of it. It needs a few things done, and cleaned up, etc. I always wanted one of these bikes growing up, but couldn't afford one. Now I'm thrilled to have one. So excited to be slowly fixing each item with the goal of getting it back to new perfect condition and having it run again. First thing I'm tackling is the ignition. The key barely fit it and even when it did, it the turning mechanism felt like rocks. I got the front end apart and pulled the ignition off. I am going to replace it but have a question. Will a CBR600 ignition fit? Based on the pictures it sure looks identical - EXCEPT all the ones I see on eBay have 6 wires to the plug. My Superhawk only has 3 wires (2 RED, 1 BLUE). 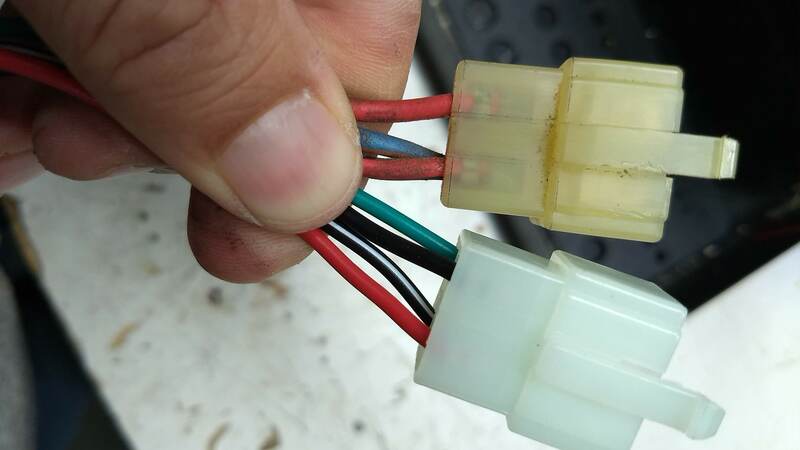 You can probably make it work, you just have to get the connectors out of the 4 prong socket and use your original 3 prong socket, it's very easy to remove them, one of the wires got to do with the parking light on some models, so you don't have to use it. My real question though is how do I match up - or can I even - go from the 4 wire design of the eBay part to the 3 wire design of the Superhawk? The actual physical connection looks identical, but the eBay part has MORE connections? 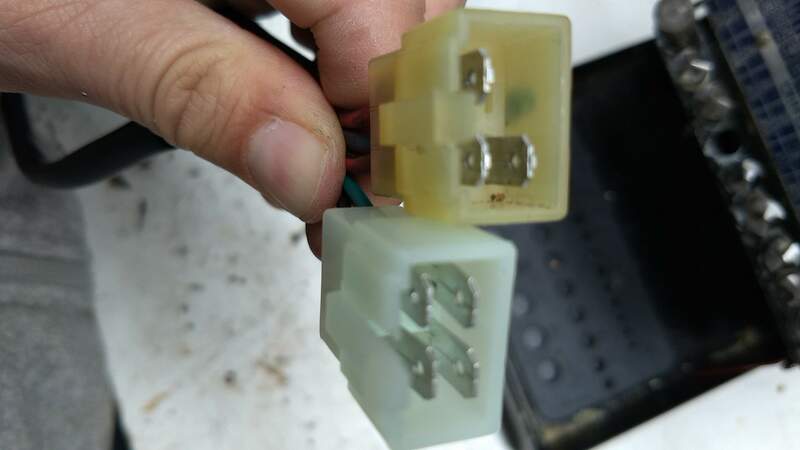 I don't mind cutting off the new connector and re-soldering to the old connector but how do I determine which of the 4 wires to go to which of the old 3 wires since I don't have a wiring diagram of the new piece? Just trial and error? 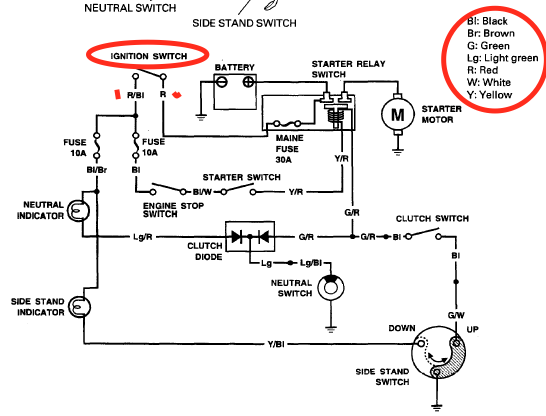 So I bought a new switch but don't have a 'pin-out' diagram for it. It's for a 1999-2002 CBR 600F4I but I can't find a schematic easily online. I've taken a few pictures to show difference. I'm not sure how to figure out what the new ignitions wires go to. I posted this on ADV site too since it's a lot more active and hoping a member has the know how but wanted to try the SuperHawk forum too since it's more specific knowledge here of course! Any help would be greatly appreciated as me and electrical struggle to work together. Thanks. I don't have a dropbox account though. I did find a 600F4I schematic online after about an hour. Then I found another too! LOL BUT, both of them show the same color wires and unfortunately those colors don't match the colors of the ignition switch I bought. 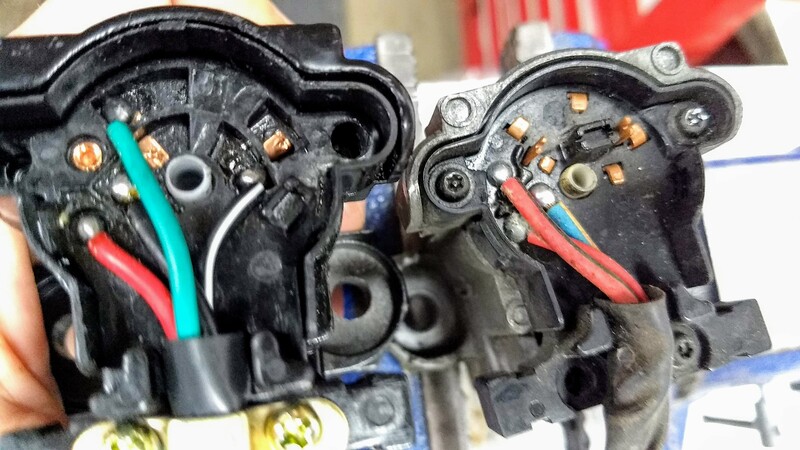 It looks to me like even though the ignition switch was advertised as for a 600 CBR4FI, and it might work, the color wires they choose to use aren't the same (I'm sure it still works, but they didn't both to match the wires with the OEM colors), so that's causing my issue. I think I have the main red and black figured out (I need to swap them in the plug). Now I just need to figure out the other two colors and which one I should be using and if I need to splice them both together into one. You need just to have the wiring diagram for each and match pin position with color and function. To me it woulda been easier to just get an ebay vtr ignition but here you are. I did a gauge swap by putting a CBR600RR dash on the VTR. I just got both wiring diagrams and numbered the pins, then wrote out the functions on one then the other to match them up. You can use a safety pin to remove the pins from the plug and put them where they need to be. I did figure out 2 of the 4 colors. So now I have power to the bike. The brake lights, starter, etc. all work with the on/off function of the new switch. The only item I have left is to figure out which of the remaining TWO wires I need to use to power the ONE wire the VTR uses for the fan. QUESTION: When you simply turn on the VTR ignition without pushing starter, does the fan run? Or does the VTR fan only run once the engine is too hot? If it only runs when hot then I won't be able to tell b/c the rest of the bike is apart for other things I'm working on. So can I just turn the ignition to ON, and bypass the switch(manually jumper the fan to ground) and the fan should turn on? 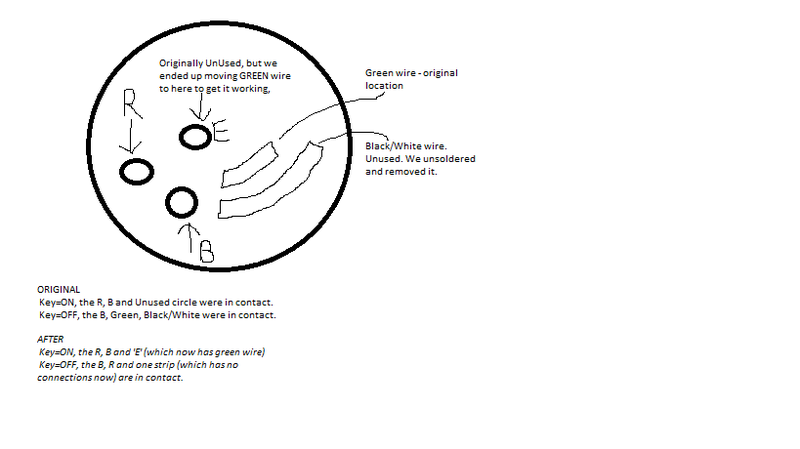 And if so, then I have the correct wire in the ignition plug it seems. I verified the 10amp fan fuse is good. I've put the picture below with what we had to do. I ended up literally taking apart the new switch down to every single piece so I could see the actual connections being made when the switch was in each positions. Once we saw that it was a piece of cake. There's no way the switch would have worked as it was right from the manufacturer for *this* bike. It was a switch for a CBR 600 F4i, so I expected some tinkering. Anyway, if anyone wants to put in a brand new ignition switch it's really a piece of cake now. Remove the old, order this one (there are tons of these same switches advertised all over eBay for every bike, but all the wiring looks the same) and move the Green wire as I wrote up below. Hope this helps anyone looking, This will let you have one new key to match ignition, tank and seat. **NOTE: I realized my picture might confuse someone, the switch I labeled 'ORIGINAL' means the OEM switch the VTR comes with. Hey good discovery. I go thru a lot of ignition switches since I ride daily and in the rain they fail pretty often. So wait the x shows where the green wire used to be, move it to its new position then its plug & play? Last edited by smokinjoe73; 02-24-2019 at 07:12 AM. Quick Reply: Ignition Wires - 2 Red, 1 Blue ?